The lower McCloud is a classic run for inflatable kayaks in late summer or early fall, when little else is running. At such times, most hardshell kayakers find flows too skimpy, and rafters would be soon stymied by a myriad of rock monsters. During spring runoff however, even rafts can negotiate this run with a bit of boat dragging near the beginning. Scenery and solitude are excellent, and catch-and-release fishing is superb. The relatively high altitude and latitude make for cool weather. Some boaters do this run in one day, but it is a very long day indeed. 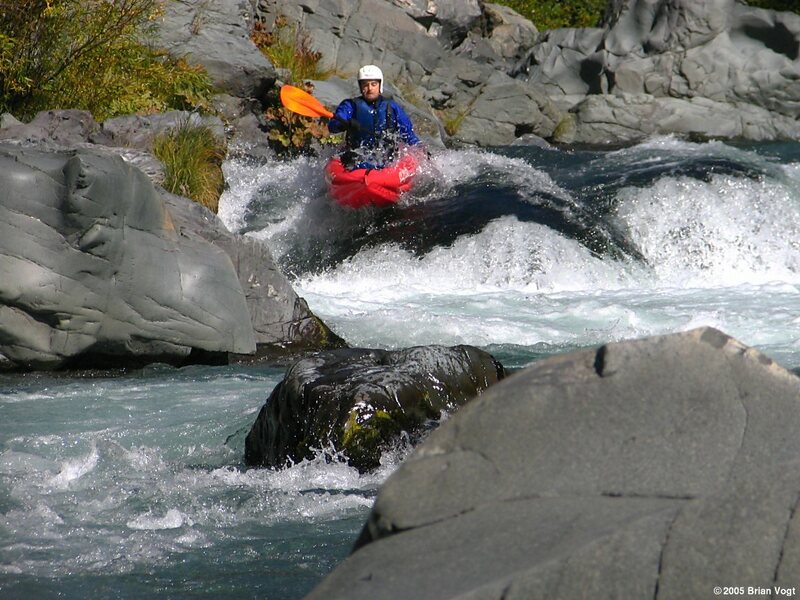 This segment contains four rapids that stand out as more difficult than others, and one of these four is more dangerous than the other three. These rapids could be rated either class IV (one IV+) or class IV+ (one V-), but because of low flows most of the year, this guidebook chooses the former. The short boat drag around the first drop of class IV+ (or V-) Tuna Falls is quick and easy. 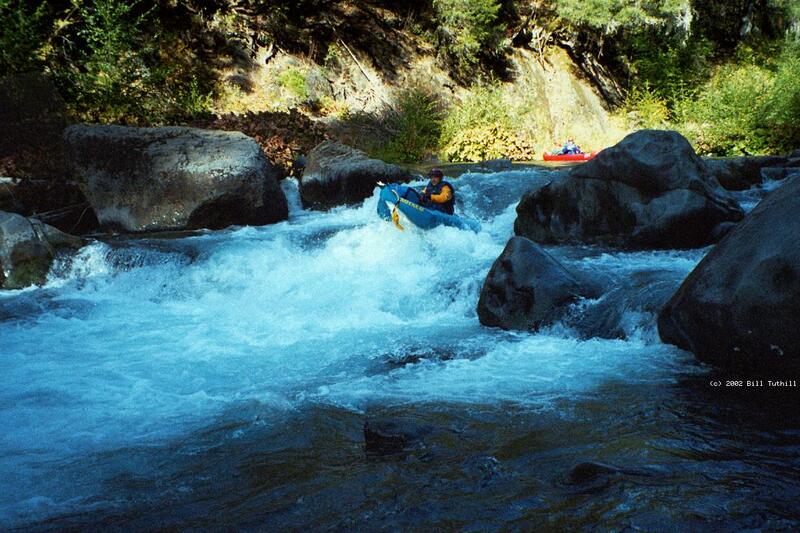 Mark Twitchell (mtwitch@shasta.com) sent this report of a trip starting right below McCloud reservoir. Doing so greatly shortens the shuttle. Rich Uhlmann and I put in at Ash Camp, just below McCloud Dam. Easy put in. There are 6 or 7 big rapids from there to Ah-di-na, mostly class IV, one or two maybe maybe Class 5-ish, the rest class II-III. Rapids are all easy to scout, if you are so inclined. We wished we had scouted a couple more times, once we were in the middle of things! We portaged one boulder mess. I think it's definitely worth doing the Ash Camp put-in. There's a lot less driving, and it's probably shorter time-wise to boat it, even with scouting/potential portaging. 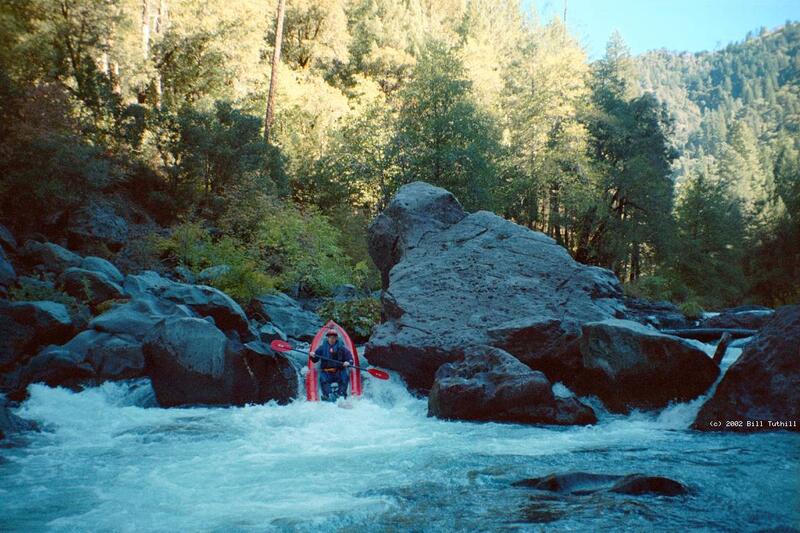 The rapids are great, too. Because of low flows (for fish release), this run places a premium on rock dodging rather than bracing. Without McCloud Reservoir, this river would contain much more water, but summer-long flows from Big Springs upstream are diverted to Iron Canyon Reservoir then to James Black Powerhouse at the end of Pit #5. This makes the fishing clubs happy, because anglers seldom like high water. 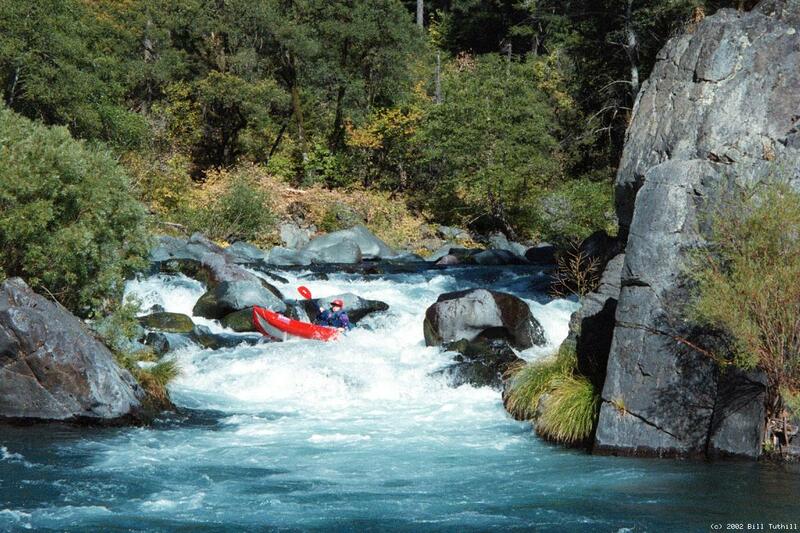 With full natural flow, this run would be similar to the Tuolumne. Rumor has it that many rivers of New Zealand were stocked with rainbow trout from this stretch of the McCloud river. Nowadays, the lower part of this stretch is populated mostly with spotted brown trout from Germany. The Nature Conservancy has been trying to save endangered species such as the Dolly Varden trout, but with their habitat and spawning grounds blocked by McCloud dam, the situation is hopeless. Put in at Ah-di-na forest service campground. A short steep trail leads down to a gravel beach. Avoid boating before 9:00 AM or after 5:00 PM to minimize conflict with fishermen. Class II-III rapids begin immediately. It is possible to extend the run 2.5 miles upstream; put in at McCloud dam and expect several portages. Nature Conservancy land. Open to the public, catch and release fishing only. 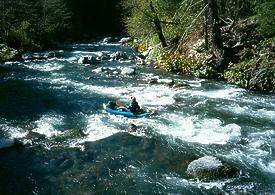 Class III rapids start to appear, with possible class IV rapids at certain flows. Nature Conservancy cabins on right bank. Except for a fishing trail on the right bank, no emergency access until mile 9. Last public land for several miles. Good campsite on left bank. GPS coordinates approximately 122°10' W 41°5' N (public land ends just before a creek comes in on the left). McCloud Club trails and possibly seasonal footbridge come into view. Squaw Valley Road bridge to private McCloud Club building on left bank; the other direction leads north to a locked gate and McCloud Reservoir Road. The McCloud Club doesn't like trespassers: in case of emergency, walk out north along Squaw Valley Road without contacting caretaker. 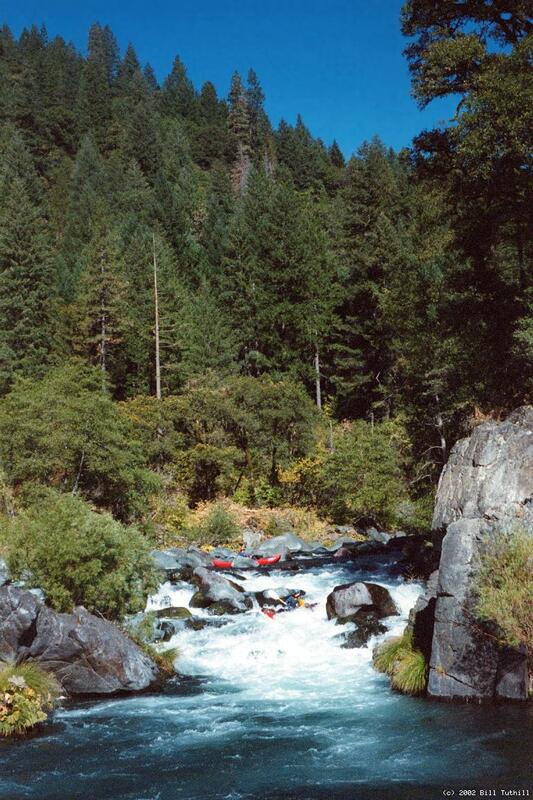 Squaw Valley Creek, a class V run with waterfall portages, was first rafted by Dean Monroe in the mid 1980s, and kayaked by Ron Rogers and Mike Cassidy in March 1994. Claiborne Creek comes in on the left. There is a small corner of public land along the river, downstream of this creek. McCloud Swim Club (class IV). Boulder slalom for about half a mile, somewhat easier after the 1997 flood. 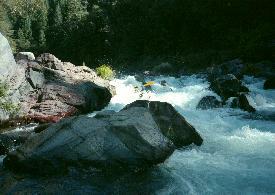 After a short recovery pool, the river drops over a 6 foot falls containing underwater rocks. Do not swim the final drop. First section of McCloud Swim Club Two simultaneous swimmers join the club! Squaw Valley Creek comes in on right. Brass sign saying Noyes Pool. Across the east side of the creek from here, a (gated) road leads out to McCloud reservoir road. Werner's Profit (class IV-). Two distinct drops, the first one very tight and rocky, the second steep with big hydraulics. Named for a paddle lost in 1995. A similar rapid, but even more rock-strewn, appears shortly below. The USFS Shasta-Trinity map indicates a small corner of public land on the right bank, GPS coordinates approximately 122°13' W 41°2' N, but the canyon is very steep in this section. Double Falls (class IV). Scout or portage left. The river bends right and drops out of sight; big rocks on left. A few small drops lead to a 4 foot falls, runnable over a fan rock just right of center. Slant left to avoid the wall on the right just below, and swim to the left bank if necessary. Only a tiny recovery pool exists before a boulder-laced 5 foot falls funnels into a wrap rock. The second drop has proven easiest to run on the far right in recent years. Chris ready to ski jump the fan rock Chris buries his boat in the center hole! Pine Flat. House on right, part of Bollibokka Fishing Club. They share McCloud Club's disdain for boaters, but aren't as rich. Tuna Creek Falls (class IV+). Scout right, line left if log-jammed. 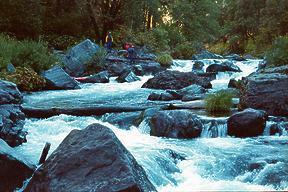 In a straight section the river drops out of sight with large partially-obscured boulders below. House high on right bank, part of Bollibokka Fishing Club. 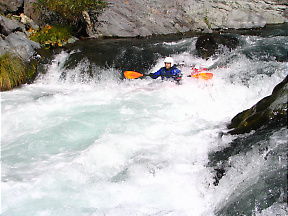 The rapid: a rough chute drops 8 feet into large reversals. 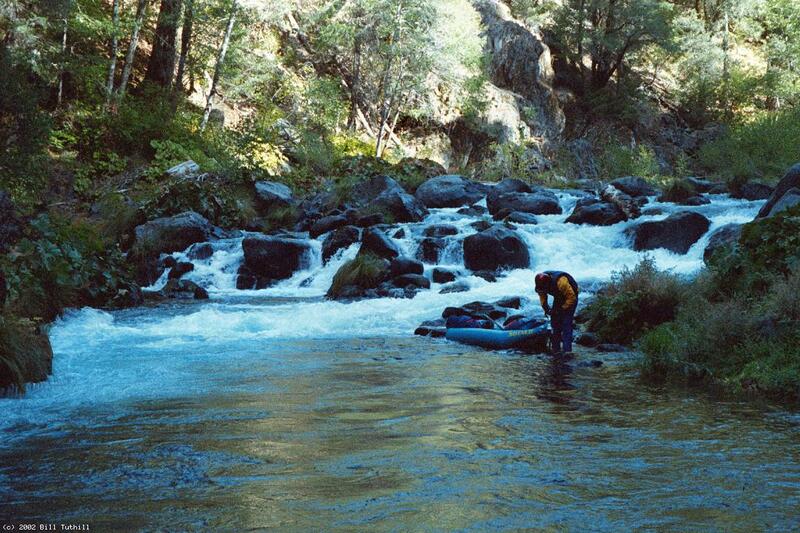 Many boaters portage this initial drop and put-in just below. Some of the current goes right, then divides around a cabin rock and drops another 4 feet. 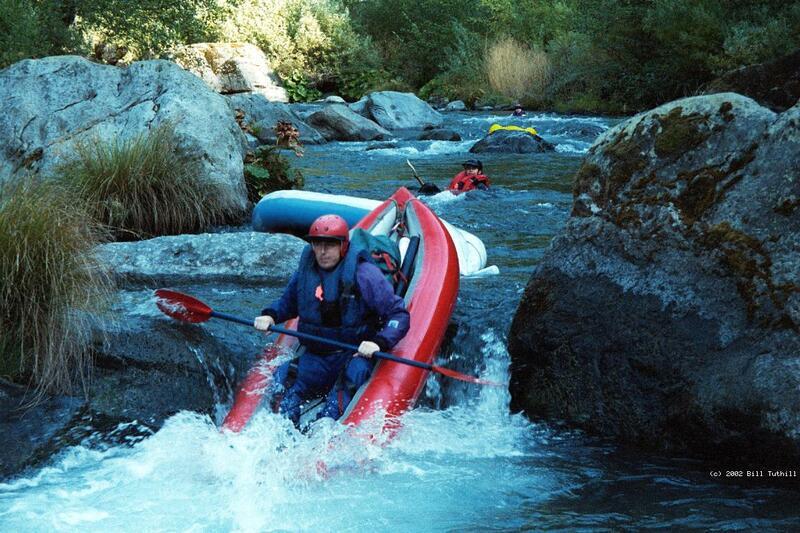 The best low-water route is a blind drop against the right side of the cabin rock. In many years logs block part of the route, creating considerable hazards. Valhalla, AKA The Reagan Years (class IV+). After a long class III boulder garden, a small eddy on the left allows you to boat scout this near-falls, a steep 8 foot chute with a rock dividing the current halfway down. Much of the current goes left into a nasty chute, so your task is to paddle hard towards the right. After the flood of 1997 you might be required to ski jump the final drop. Rapids become II-III instead of III-IV, pools become longer. 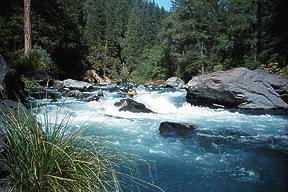 Only a few class III+ rapids remain, one a boxed-in hole (dubbed Rorie's Hole) shortly below Valhalla. Chatterdown Creek comes in on left below private cabin, just above a giant rock usually decorated with log strainers. The USFS Shasta-Trinity map shows a large chunk of public land on both banks, after the river bends sharp left and curves gradually right again. Gauging station on right. This is MSS, McCloud inflow to Shasta reservoir. Bollibokka Club, a private fishing village on right. Road cut is evident from here to take-out. The high-water mark of Shasta reservoir is soon visible. The river curves around Bollibokka Mountain on the left, made of the same rock formation as Castle Crags. Take out on the right below the Gilman Road highway bridge. To reach take-out, exit I-5 at Gilman Road and drive east 17 winding miles (all paved) along the McCloud arm of Shasta Reservoir. Because of the long shuttle, it is advisable to invite a friend to fish and camp at Ah-di-na, so someone can to drive your vehicle back to meet you at take-out. To reach put-in, return to I-5, proceed north and uphill past Dunsmuir, then turn east onto highway 89 near the town of Mount Shasta. At the town of McCloud, turn right onto Squaw Valley Road, and follow signs 10 miles (all paved) to McCloud reservoir. Past the left turnoff to Tarantula Gulch boat ramp, but before the dam, turn right onto a poor dirt road and drive 6 miles uphill and then downhill to Ah-di-na campground.